J. alpinus of Michigan Flora. Moist ground, especially wet sandy and gravelly (often calcareous) shores. This species and J. articulatus are often difficult to distinguish on the basis of any single character, some exceptions occurring to each item in the key. For example, certain collections from near Laurium (Houghton Co.) have shorter, rounder petals than usual for J. articulatus, but are referred to that species by the spreading inflorescence and the shape of the capsule. (The capsule of J. articulatus tends to taper throughout the terminal half, while that of J. alpinoarticulatus tapers more rapidly nearer the end.) 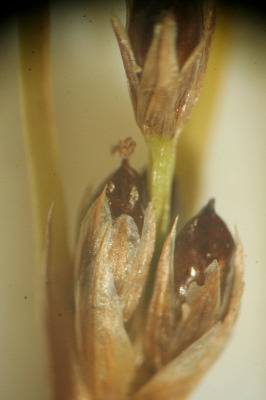 Some other plants have more acute sepals than usual for J. alpinoarticulatus, but are referred to that species by the strongly ascending inflorescence and the petals, which are distinctly shorter than the sepals. More or less sterile intermediates are suspected of being hybrids. MICHIGAN FLORA ONLINE. A. A. Reznicek, E. G. Voss, & B. S. Walters. February 2011. University of Michigan. Web. April 18, 2019. https://michiganflora.net/species.aspx?id=1498.